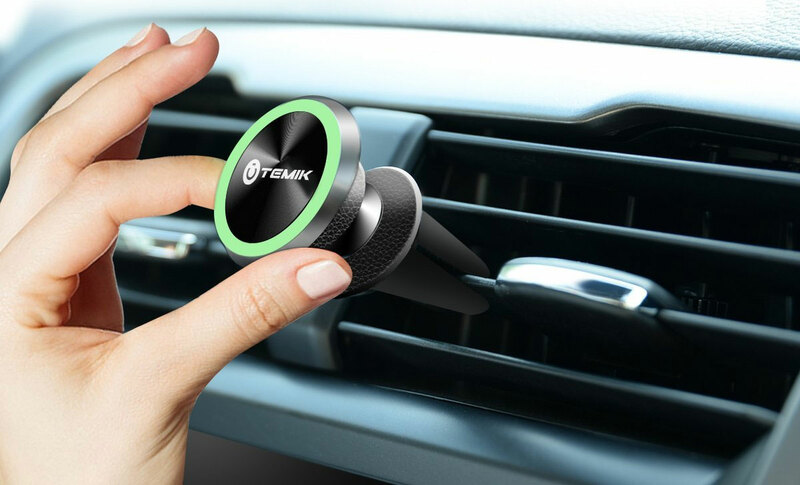 While windshield mounts will do the job, an air vent smartphone car mount is more convenient and flexible. OTEMIK’s simple solution is ideal for smaller, lighter smartphone and costs just $10.99 from Amazon. If you’re unfamiliar with these types of mounts, they work by using a magnetic plate typically placed on the back of your smartphone. They also work when placed between a phone and a case. You then place the phone on the mount and it’s held on quite well. OTEMIK’s mount is on a bit on the small size, but works adequately with my Galaxy S7 and a Speck CandyShell Grip case. Bigger, heavier phones might not stay on as well, in which case larger mounts are recommended and will likely cost the same. The mount itself smoothly rotates, allowing you to select the ideal angle for your usage. Even when going over bumps, everything stays where you want it to. There’s also a glow-in-the-dark ring on the front of the mount for a flare of design. For a ten and some change, this mount does the job while being portable and capable. It’s certainly worth a look.